This is a bit of an in-between time of year culinary speaking – cold enough that we still require some hearty ballast to keep us going but I am also looking for a bit of spring time zest and greenery to perk up the taste buds. To commence the farewell and see you later in the year to the stews and rich roasts of winter if you will. We have also, without trying to bore you, been eating less meat for a while. Not that we don’t love it, I live with a committed South African braai master carnivore after all. Just that I wanted to up the vegetable intake partly for healthy reasons but also to encourage the you know who’s that our green and purple and orange friends are fabulous. This quest continues with mixed results. Last week as a half term treat (just kidding) I made a garlicky aubergine dip, a sort of baba ghanoush. My son ate what he had been given, said it was quite nice but firmly refused seconds. My daughter meanwhile looked as if I had fed her a spoonful of wet sand. Along with aubergines then, courgettes are one of the vegetables that appear more for my husband and I than for when we are gathered en famille. Don’t get me wrong, I am not one for dancing around my children offering them only what I know they will eat. No, no, no I constantly try new things, or old things in new guises. It is just that I remember the misery, as a child, of being faced with something I simply hated eating and see no point forcing the issue. So the courgette, chilli and garlic to go with pasta. An easy, quick lunch, the chopping taking less time than the pasta does to cook. I used penne today but often use linguine. The capers are optional but add a bite to counter the sweet softness of the courgette and you do need some heat, I start with half a chilli and add more if it turns out to be a mild one. Put your pasta on to cook. Heat the oil on a frying pan, add the garlic and chilli and cook gently while you grate the courgette. When the pasta is nearly cooked add the courgette to the frying pan and turn up the heat. Keep stirring so it doesn’t catch, you want the courgette to soften and lose a little water but not so much it becomes a khaki sludge. 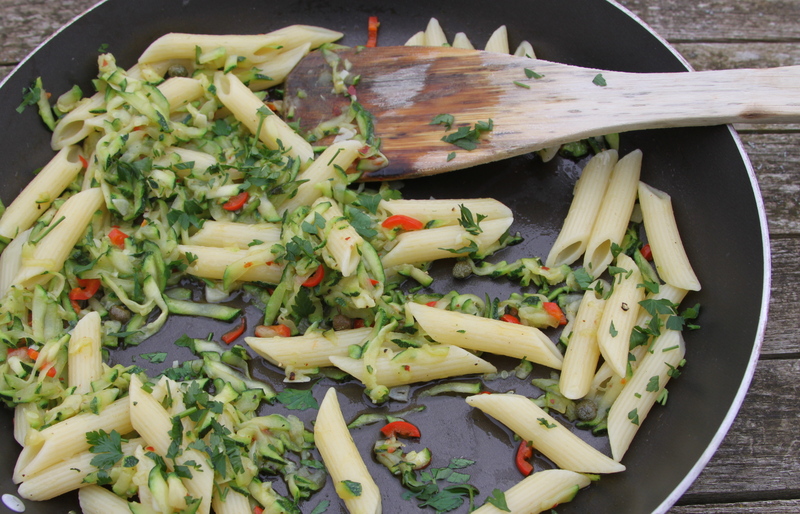 When the pasta is cooked, drain and add to the frying pan along with the capers if using. Give it all a good stir, season well and sprinkle with parsley. Serve with parmesan if you like. At this time of year I feel a little envious of those folk who enjoy eating, and therefore make, marmalade. It seems such a happy and sensible seasonal tradition and I am a great fan of such things. I imagine them pottering in a warm fug of a kitchen, the table covered in sticky dripping pots, happy in the knowledge of their marmalade lined larder shelves for the coming year. The problem for me is I don’t like marmalade, or rather the bits. I do like orange jelly, shredless in other words, particularly on sausages but feel rustling that up might be an insult to those special Seville oranges. I could of course, be entirely selfless and make pots of the proper stuff for those who love said conserve but in all honesty I have other things to do. My children love blood oranges which of course are around at the same time as the Seville and we amuse ourselves with cutting one into sixths and sucking them, monkey like, our lips covering the skin and then grinning to reveal. Honestly, endless fun. So I needed to do something with oranges this cold, grey February and all that monkeying around got me thinking. 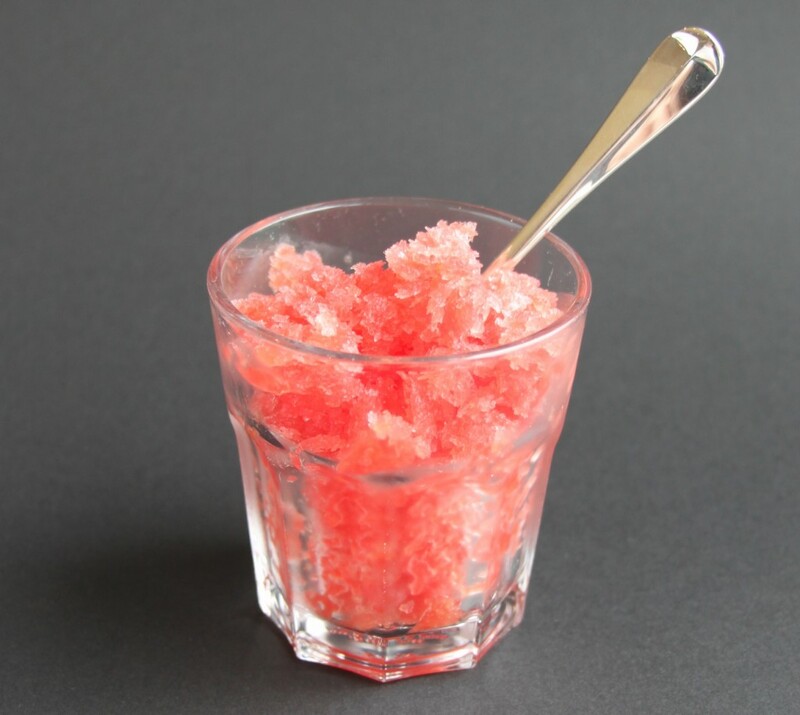 Blood Orange Granita is the delicious and gratifying result. Sharp and sweet, a stunning colour and a perfect light refreshing pud after a rib sticking winter stew and dumplings supper. Dissolve the sugar in the water over a gentle heat. Then mix with the blood orange juice and pour into a plastic container with a lid. Freeze for 3 hours and then give it a good stir, mixing the frozen edges with the probably still slushy middle. Freeze for another couple of hours and then scratch into crystals with a fork and serve in small tumblers. If you have made this ahead and it is frozen solid, take it out of the freezer about 30 minutes before you want to serve it. This would fill four small glasses but can easily be doubled. Come on, it wouldn’t be February without some soup. 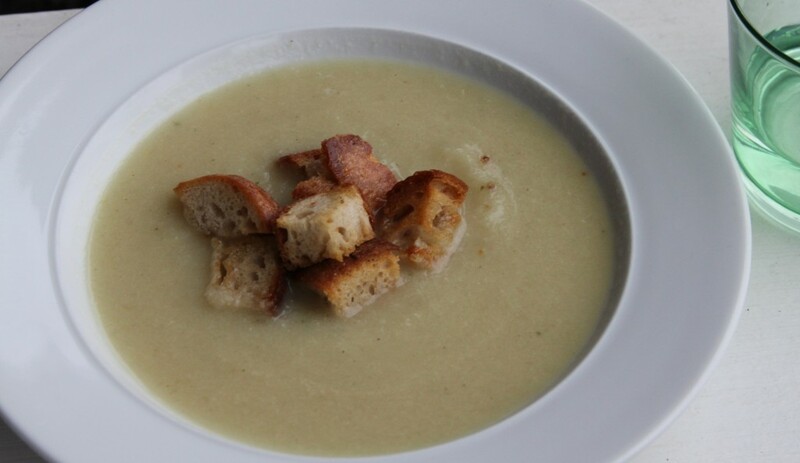 Cosy, warming, cheap, healthy soup. Usually vegetable for us but that is not to say that a hot and sour prawn broth or a chilli spiked, coriander strewn chicken one wouldn’t be delicious, it is just that soup is often a quick easy lunch made from whatever I can find in the larder and perhaps needs using up. Now, whilst I love the deep brown and savoury French Onion Soup, sometimes I like something a bit gentler and softer around the edges – more a hug than a rugby tackle. This is just the ticket. Easy peasy and cheap to make, it seems less identifiably oniony to children as well once blended. Some quickly made crunchy oven baked croutons would be perfect here. Heat the oil in a large pan over a gentle heat. Add the onions and a good pinch of salt and cook without colouring for about 30 minutes until very soft and much reduced. Add the stock and milk and simmer for a few more minutes. If this is just for grown ups and you want to add a slosh of sherry, now is the time so it gets a chance to cook and lose the raw alcohol taste. Blend in a liquidiser or with a handheld blender and serve with the lovely crunchy croutons and that swirl of cream if you like. Croutons – cut the bread into cubes, pop them in a small baking tray and turn in the oil, bake at 200 for about 10 minutes until light brown and crispy.